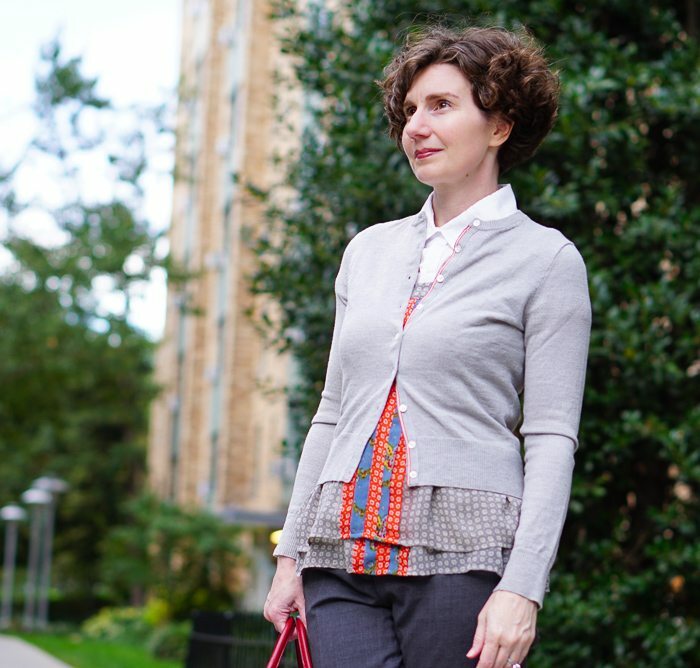 In the early days of fall, a lightweight sweater is just right for the addressing the temperature and the season. You have to hold something in reserve because this . . . Washington D.C. in October . . . is not cold. So here I am, indexing the gauge of my sweater for temperatures in the low 60s. 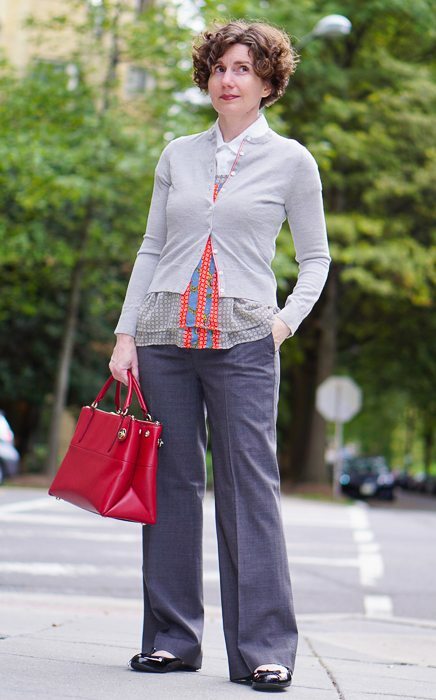 Many months ago, I posted The Man in the Grey Flannel Suit, Re-mixed and someone asked how to combine a number of greys in one outfit. In a dereliction of duty, I failed to post a prompt response, but here’s my advice. First, take note of the undertones of the greys you are considering. There are true greys (like the ones I am wearing), blue-greys, lavender-greys, and brown-greys. Ideally, when you combine greys, you are combining shades of the same grey, rather than mixing undertones. Second, it’s much easier to mix two greys if one them is a tweed fabric or marled yarn rather than a straight solid. My pants are the darkest grey. 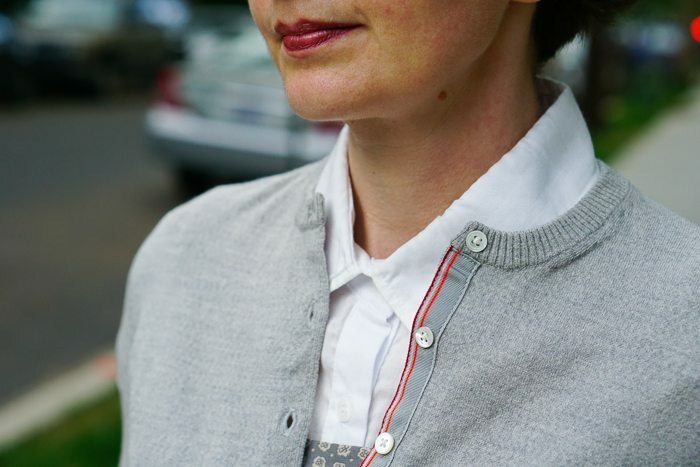 The blouse has two greys in it and the sweater matches (more or less) the lighter of those greys. You may remember these printed tanks (I am wearing two, layered), last seen with navy and slate blue in the spring? Here, I am wearing them with a very soft, short-sleeved, collared blouse underneath. The judge was Justice Souter, shortly before he was elevated to the First Circuit, where he sat briefly before his appointment to the Supreme Court. A favorite jurist of mine! If you haven’t read his beautifully expressed thoughts on constitutional law, I will add to the depth of your day by providing a link: Beautifully Expressed Thoughts Right Here. 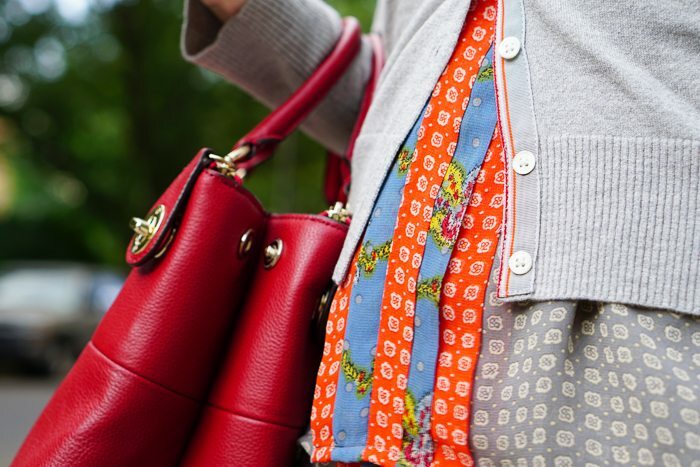 The handbag is SO pretty – and the pants – the pants I have to have multiples of. Classic shape, best color ever – “slate/charcoal/grey” (I have silver hair and it just goes). I just read the Judge’s words. He has such an eloquent manner, and he’s right – we must keep seeking to respectfully understand. Thanks for sharing! Lovely! I was the grey-curious poster who’d asked the question. I’m going to see what I can pull together from my wardrobe. Definitely need some grey pants like those. October in DC is delightful and cannot make up its mind. Layers are a savior. I like the combination of lengths and proportion in your ensemble. I know — it’s the best time of year! Lovely mornings, lovely evenings, beautiful light.